There’s an intersection in my neighborhood that makes me nervous to drive through. 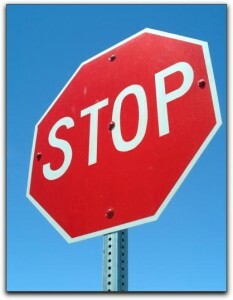 Imagine a quiet suburban street that goes north-south which intersects the east-west streets that only have stop signs. I’ve observed that frequently cars travelling east-west roll through their stop or assume it is a four-way stop and the perpendicular traffic will yield to their non-existent red octagon. Literally this is an accident waiting to happen. As a result of the limited trust I have in the drivers going the other way, when going north-south I tend to slow down. And when I do my wife mocks my intersection risk management. Next, I know a fellow who used to lock his car doors when he drove (much to the ridicule of his elder sibling). It was all giggles until once at a red light, someone opened the elder brother’s car door and stole what was on his passenger seat. This all reminds me of the poem “La cigale et la fourmi” by Jean de La Fontaine that I had to memorize in the third grade. You’ll know it: it’s the one about the cricket who is having good times singing all summer while the ant was saving food preparing for the winter. Well the cricket laughed at the ant’s risk management practices and you know what happened? The cricket died in the winter. He died. Most often people don’t manage risk until something bad actually happens and by then sometimes it’s too late (see cricket above). So don’t make fun of risk management or those who do it.